Congress undid some of its planned cuts to veterans' benefits in the latest spending bill, but it also left the vast majority of the reductions in place. And in so doing, it ensured that the white-hot controversy over benefits will not go away any time soon. The omnibus spending bill removed some reductions to medically retired veterans' retirement benefits, but that was a small part—less than one-tenth—of the $6 billion-plus cut included in the December budget deal. And that restoration won't be enough for the outside veterans groups, who have launched an all-out effort to reverse the cuts and have vowed to keep fighting until all the funding is restored. Veterans yield political clout, and after an endless string of statements pledging to "support our troops," lawmakers are loathe to have crossed them. And so the repeal effort is gaining traction: The Hill estimates that one-third of lawmakers have backed a proposal to reverse the COLA cuts to working-age military retirees included in last month's deal. But in a budget constrained environment, the money to reverse the cuts has to come from somewhere, and that's where the unity shatters. Here are some of the proposals. Adding to the Deficit: Simply repealing the cuts and letting the spending add to the deficit is thus far the solution that has been proposed the most. In the upper chamber, Sens. Kay Hagan, D-N.C., and Mark Pryor, D-Ark., have introduced legislation to repeal, while in the House, Reps. Robert Wittman, R-Va., Jeff Miller, R-Fla., and Julia Brownley, D-Calif., have introduced similar legislation. Wrap It Into a Larger Veterans Bill: The latest proposal to reverse the cuts comes from Sen. Bernie Sanders, I-Vt. Sanders introduced an omnibus veterans bill Thursday evening that deals with a whole swath of issues from restoring the COLA cuts to expanding scholarship funds. And it looks like it could have momentum. Senate Majority Leader Harry Reid, D-Nev., is expected to file the legislation under Rule 14, allowing it to skip the committee process. Tax Changes: Sen. Jeanne Shaheen, D-N.H., and Rep. Dan Maffei, D-N.Y., have introduced legislation to swap the roughly $6 billion in cuts with a closing of a tax loophole for offshore corporations. But tax reform—while supported generally by both parties—is typically more popular in theory than practice, and it has faced a serious uphill challenge. Shaheen, however, has noted that she is willing to be "flexible" on how she offsets reversing the COLA cuts. Undocumented Immigrants: Rep. Mike Fitzpatrick is taking a different approaching, pressing to reverse the COLA cuts by increasing requirements to receive the Refundable Child Tax Credit. The Pennsylvania Republican wants to prevent undocumented immigrants from being able to claim the credit. Sen. Kelly Ayotte, R-N.H., has introduced similar legislation in the Senate. Her proposal got a momentary boost when Armed Service Committee Chairman Carl Levin, D-Mich., told reporters he would support her bill, but his office quickly retracted his statement, saying the senator didn't realize it was offset by targeting undocumented immigrants. Blocking Foreign Aid: Rep. Ted Poe, R-Texas, wants to reverse cuts by blocking foreign aid to Egypt or Pakistan. His attempt goes against the omnibus bill which would allow the Obama administration to resume more than $1 billion in aid to Egypt. And it isn't the first time Poe has tried to block foreign aid to Pakistan. 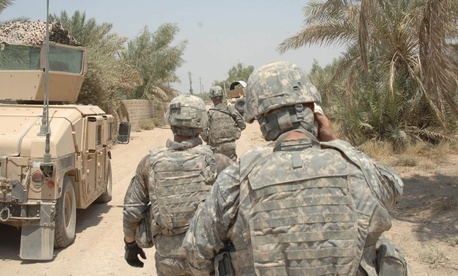 When many of the armed-services branches, as well as the Coast Guard, suspended their tuition assistance programs, Poe suggested suspending aid to Pakistan until the programs were fully funded, despite the significant difference in spending both programs require. Poe would also help offset the costs of reversing the full COLA cuts by authorizing the sales of some federal land overseen by the Bureau of Land Management and the national forest system. Attacking Obamacare: Rep. Scott DesJarlais, R-Tenn., introduced legislation that would restore COLA funding and make up the added cost by reducing the Affordable Care Act's Prevention and Public Health Fund. The fund, part of the Affordable Care Act, invests in programs aimed at improving health quality and outcomes; it also supports prevention programs. DesJarlais isn't the first—and likely won't be the last—Republican congressman to target the fund, and the Obama administration has already used some of the fund to pay for other parts of the Affordable Care Act. Sen. Ted Cruz, R-Texas, also tried to amend the omnibus to repeal the Affordable Care Act and restore the full COLA funding, despite the fact that any significant changes to the ACA are a nonstarter in the Democratically controlled Senate. Drugs for Veterans: Rep. James Lankford has introduced legislation to repeal the COLA cuts and swap out the funding by requiring the departments of Defense and Veterans Affairs to purchase contracts for prescription drugs together. The Oklahoma Republican points to $660 million saved by the VA in 2005 under a similar joint-purchasing policy. Changes to the Postal System: Rep. Darrell Issa, R-Calif., is proposing to restore COLA funds by implementing a modified Saturday delivery schedule. The Postal Service previously tried to change its Saturday delivery schedule, but members of Congress blocked the attempt. From Other Defense Department Spending: Rep. Gus Bilirakis, R-Fla., would offset the approximately $6 billion in cuts by reducing the Defense Department's unobligated funds. The department finished the 2013 fiscal year with $65.4 billion in unobligated money, after using the fund to help stave off the effects of sequestration.